"Peach gelatin with chunks of pineapple has a base layer of creamy whipped topping when it's unmolded for this pretty dessert or side salad." Stir boiling water into gelatin in large bowl at least 2 minutes until completely dissolved. Stir in cold water. Refrigerate 45 minutes or until slightly thickened. 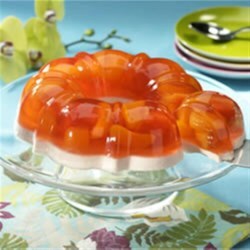 Remove 1-1/2 cups gelatin; let stand at room temperature. Whisk whipped topping into reserved gelatin until blended. Spoon over gelatin layer in mold. Refrigerate 4 hours or until firm. Unmold. Substitution: You can use 1 (15.25 ounce) can DOLE® Tropical Fruit, drained, instead of the pineapple chunks.